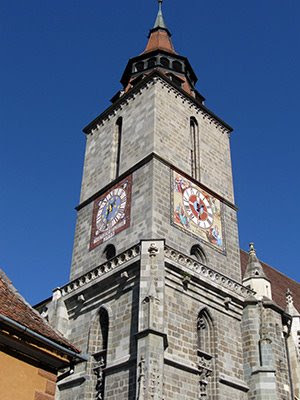 Brasov’s strategic geographical position, close to the commercial route Rucar – Bran, through the Carpathian Mountains, has influenced the economic development of the city. Thanks to its nearness to Bucegi Mountains and the Bran Castle, Brasov is one of the most important destinations in Romania. In 1421 an important part of the construction was destroyed during the Turkish invasion, and that is why the church was completely built in 1477. Nowadays it is considered the greatest place of worship in Romania, with impressive dimensions: 90 meters in length, between 25 and 37 meters wide, 65 meters from the floor level to the highest point of its Cross tower, while it can house about 5000 people. More than that, the biggest bell in the country, weighting 6.3 tones, is to be found in its tower as well. 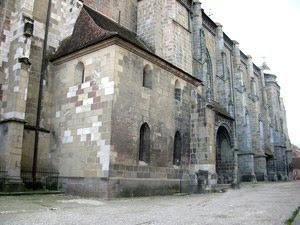 Then, after almost 200 years, a fire partially destroyed it in 1689, and the smoke blackened the walls, and for a long period of time the façade couldn’t be renovated. 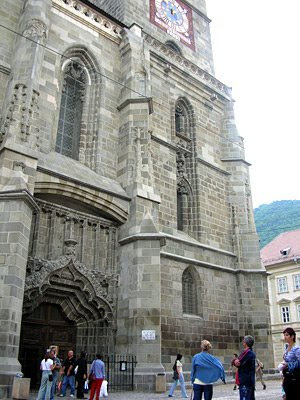 The restoration lasted about 100 years, but the place of worship was called Biserica Neagra (the Black Church) because of its black smoked walls (Die Schwarze Kirche in German and Fekete Templom in Hungarian). The present roof, 20 meters in height, was also built after this fire. The workers who restored it were from Danzing, and this is the reason why the new vaults are in Baroque style and not in Gothic. The Black Church’s organ, with 4000 pipes and considered one of the biggest in Europe, was built between 1836 and 1839 by the Berlin organ maker Buchholz, and it is famous for its sonority. In 1924 the gallery in front of the organ was enlarged in order to organize sacred music concerts with chorus’ participation. Many vinyl discs, audio tapes and CDs were made in the course of years. Nowadays an organ concert is organized every week. The collection of old carpets from Brussa, Usak and Ghiordes regions in Asia Minor, dating from the 17th and 18th centuries represent an invaluable thesaurus of the Black Church. Those were donated in the course of years by the craftsmen, merchants and citizens of the city. The furniture and worship objects represent other remarkable values that turn this construction into a place that no tourist can miss. For instance, the bronze font made by the local craftsmen was donated in 1472 by Vicar Johannes Reudel. After almost 150 years, in 1716, blacksmith Meensen Hannes made a wonderful wrought iron grating that surrounds the font. Then, in the South porch there is a mural painting made after 1476 that shows Virgin Mary and Child Jesus, featured between Saint Catherine and Saint Barbara. The crests of Matthias Corvinus and his wife Beatrice of Naples – Aragon are at the bottom of the painting. Three folds, with five paintings from the Feldioara altar (the end of the 15th century) are also to be mentioned. The pews in the naos date from the end of the 17th century and the first half of the 18th century and have Baroque wooden carved ornaments. Then the lecterns are in neo - gothic style, dating from 1866, and the pews in the centre of the naos, made of oak wood, were placed there in 1937. The old tombstones of some famous personalities of the city were built in the side spaces of the West entrance when the neo - gothic altar was built (in 1866) and when the heating system was installed (in 1937). An oiled canvas representing “The Wedding From Cana (Nunta din Cana)“, work of Hans Eder painter, it is exposed on the frontal wall of the northern lateral nave. Hans Elder’s oil painting showing “The Wedding at Cana” is exhibited on the frontal wall of the North side naos. The emblem of the city, representing a crown on a rooted trunk, is plotted in relief on the pillar in front of the pulpit. Inside the church there are also some sculptures, the oldest of all being the bust of Saint John the Baptist. The others represent Saint Thomas, Saint Jacob the Pilgrim, Jesus Salvator Mundi, Virgin Mary, Saints Pavel, Luke and Sebastian. A sculpture uncommon for a place of worship is to be found on the North buttress. It is about the representation of a child that seems to be about to fall. The legend says that when they were building the church, one of the workers became jealous of a very talented apprentice. At one point he asked the child to lift something from the cornice, and when he leant out, the worker pushed him. The legend also states that the sculpture was made by the other workers to the memory of the cowardly killed child. 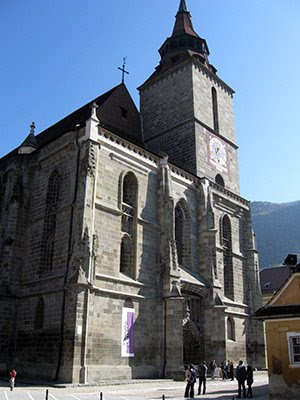 In the course of time, Biserica Neagra (the Black Church) endured several maintenance and restoration works. Between 1937 and 1944 the sculptures from the exterior buttresses were replaced with copies, and the originals were sheltered inside the church. Between 1967 and 1977 the money for renovation was from the public budget, and the restoration after the earthquake in 1977 was made with money from donations and subscriptions. After the touristic estimations, about 100 000 persons visit Biserica Neagra (the Black Church) every year, being considered the second major attraction in the county, after The Bran Castle. The visiting program is daily between 10 a.m. and 5 p.m., and the price of a ticket is 4 lei for adults and 2 lei for students, pupils and pensioners. At the entrance there are points of sale with postcards with the whole church and with details of it. Taking photos and making films are forbidden. One can easily find accommodation units in the vicinity of the church, in hotels and boarding houses.